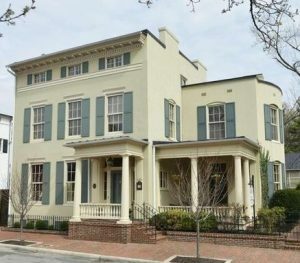 The elegant Fuller House Inn is one of Old Town Winchester’s historic gems. And now, the Fuller House Inn’s Cottage is available for overnight stays! Tucked away in the formal garden behind the main house, the Cottage is a private oasis in the heart of downtown Winchester. Whether you’re looking for a romantic getaway or comfortable, corporate lodging, you can stay in a quiet location just 2-1/2 blocks from the action along the Old Town pedestrian mall. The Cottage’s first floor includes a kitchenette with granite countertops, coffee maker, microwave, refrigerator and wireless internet. The cheerful second floor, accessible by stairs, includes a king-size bed with memory foam mattress, sitting area and full bath. The Cottage is suitable for up to two people. The Fuller House Inn also offers packages for small weddings, special events and elopements in its formal rooms, garden and cottage. Two Virginia, court-appointed marriage officiants are on site for your marriage ceremony, elopement or vow renewal. Please contact us if you’re interested in a grand mansion experience for an affordable price. We would love to hear from you!